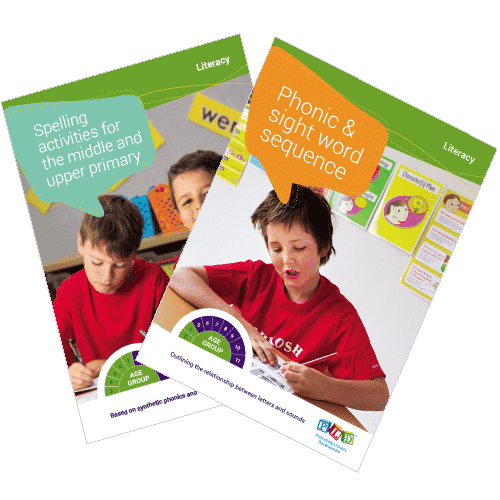 Recommended middle and upper primary spelling activities (which are based upon synthetic phonics and linguistic theory). The activity templates are ready to photocopy. A key resource when establishing a spelling program. A structured scope and sequence for primary schools, outlining phonic concepts, reading and spelling words. Stages 1, 2 and 3 primarily outline structured synthetic phonics content along with common bound morpheme suffixes. Stages 4, 5 and 6 are comprised of structured synthetic plus more sophisticated word attack skills such as spelling based upon syllables, prefixes, suffixes and morphemes. Placement tests, term reviews and short investigations when students are slow to progress are included. Guidelines for the explicit teaching of sight words are contained within the Appendix.